Highly experienced periodontist and implant specialist, Dr. Jin Kim, welcomes new patients for guided dental implant placement when replacing missing teeth with dental implants in Diamond Bar, CA, and Garden Grove, CA. Dr. Kim incorporates advanced imaging technology and 3D planning software for precision placement of dental implants in both of his state-of-the-art practice facilities. As an industry leader, Dr. Kim proudly serves his patients with his extensive knowledge, advanced expertise and refined techniques in full-service periodontics and implant dentistry procedures. Dr. Jin Kim, renowned periodontist and implant specialist, now welcomes new patients for guided dental implant surgery at both of his specialty practice locations, in Diamond Bar, CA, and Garden Grove, CA. Guided dental implant surgery is a cutting-edge technique that utilizes computer-generated surgical guides to increase predictability and success when planning and placing dental implants in the jaw. He is highly focused on providing the highest standard of care through cutting-edge techniques and offers the latest in tooth replacement with dental implants to Diamond Bar, CA, and Garden Grove, CA, patients. 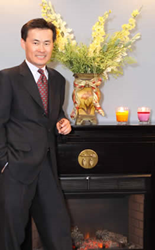 As an industry leader, Dr. Kim proudly serves his patients with his extensive knowledge, advanced expertise and refined techniques in full-service periodontics and implant dentistry procedures. Guided dental implant surgery allows for greater control and accuracy when planning for and replacing missing teeth with dental implants. The treatment concept incorporates advanced Cone Beam Computed Tomography (CBCT) imaging technology and 3D software to create a virtual representation of a patient’s jaw, bone tissue and other oral anatomy. Through these modalities, the dental team is able to generate a surgical guide of resin that sits over the implant site, facilitating the placement of each dental implant with high-level precision. The results of guided implant surgery are deemed safer, more efficient and more predictable over a freehand surgical approach. Dr. Kim is pleased to offer the latest in state-of-the-art care to patients seeking dental implants in Diamond Bar, CA, or Garden Grove, CA, and surrounding areas. A board-certified periodontist and fellow of the prestigious International Congress of Oral Implantologists, he has advanced expertise and experience in all types of periodontal and implant cases, including those complex in nature. Dr. Kim is highly regarded as an international leader in the fields of periodontology and implantology, and is the specialist many referring doctors and patients trust to restore function to the smile after tooth loss. Those interested in visiting a periodontist for dental implants in Diamond Bar, CA, or Garden Grove, CA, are encouraged to call 909-860-9222 for the Diamond Bar location or 714-898-8757 for Garden Grove location to schedule an appointment with Dr. Kim, or visit his website at http://www.drjinkim.com for additional information regarding his specialty services.